Because to much of our delicious treats would kill our beloved dog Scout. Hence the explanation why Dead Dog Chocolate is the name of the company of Damaris and Katelyn. Heavily influenced by the authentic way of Mexican chocolate making, they are based in Denver, Colorado USA and are part of the blooming American bean-to-bar chocolate scene. Their line up of bars include different flavor infused bars made with origin cocoa from Bolivia, Dominican Republic and Peru. cocoa for my taste, but still shouldn’t be too sweet. So let’s see what this little bar is all about! First thing that strikes me is the physical size of the bar. By far the smallest and lightest I encountered so far at 0,85Oz or 24 grams. But hey, you know what they say, size really doesn’t matter! The wrapper looks amazing. 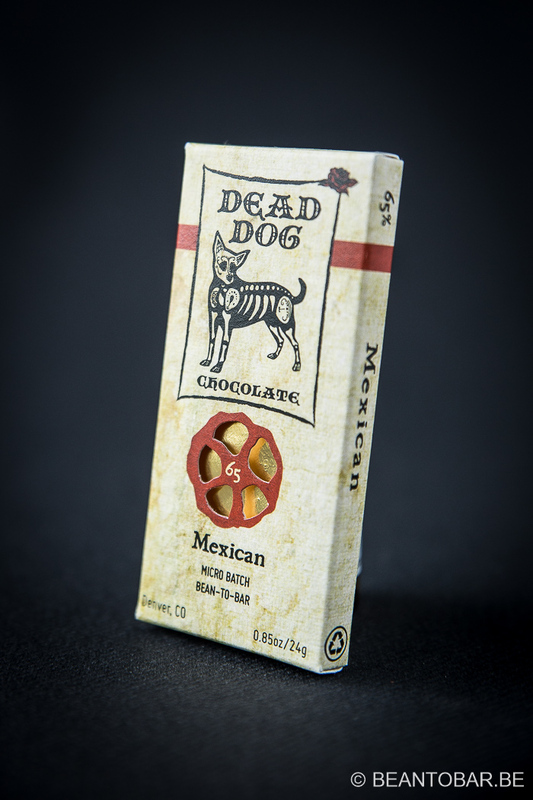 A big dead dog logo in a typical Mexican style reminding me of the Día de muertos, Underneath a small cut-out in the box reveals a golden foil underneath. An attractive view. Inside, the little bar looks pretty nice as well. 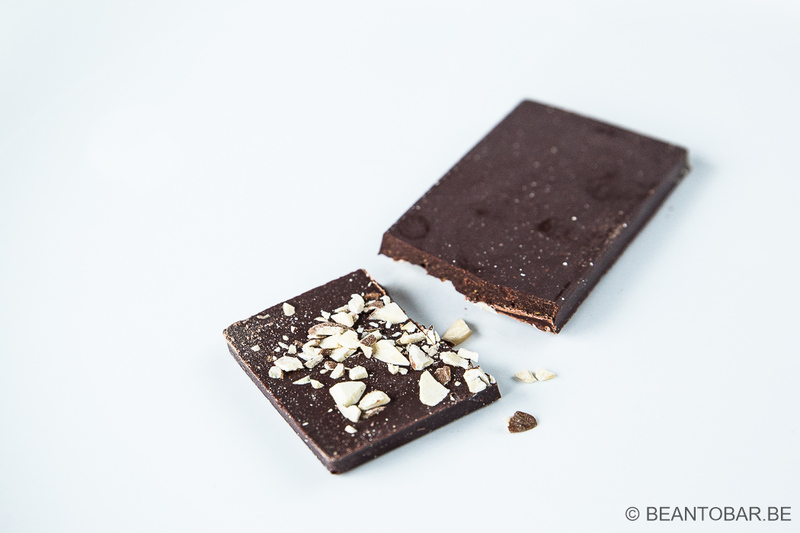 Pure white pieces of almond cover a thin rectangular bar of chocolate. Good points for looks. Never mind the slight bloom due to transport across the Atlantic. Aroma: Cinnamon. Heaps of it. Plus a spicy back tone. You hardly notice any chocolate aromas. Taste: The pieces demand you to chew. It releases an instant amount of glorious cinnamon, followed by a peak if chili tickling the back of your mouth! The flavors are bold and powerful. Though the bar is very flavorful to say the least, I’m missing the chocolate part. For a moment there are some earthy tones but they lack persistence to counter some of the spiced heat of the infused bar. 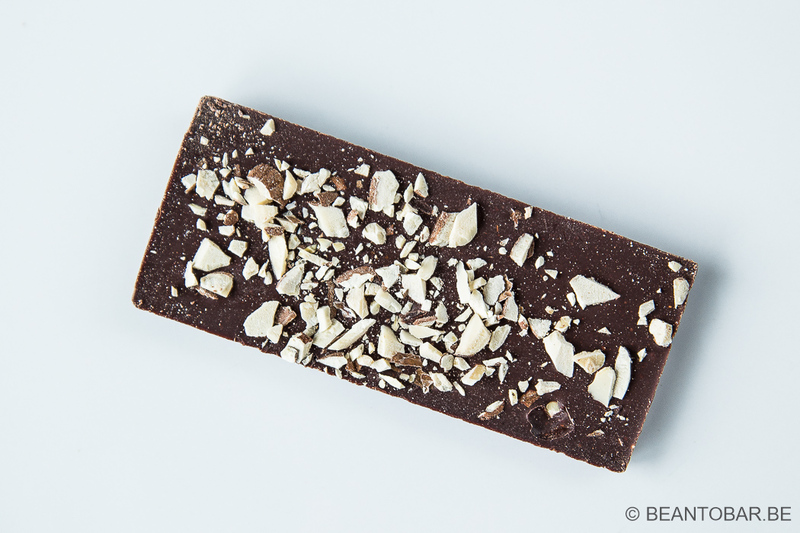 The spices even mask the relative high sweetness of a 65% chocolate. The chocolate itself is grainy and a bit dry, due to the cocoa being stone ground I would guess. The aftertaste keeps concentrating on the spices and the tickle in the back of the throat once more reminds you of the chili involved. This bar has a lot of appeal in the looks. When it comes to taste, it leaves an impression for sure, but not on the points I would like it to. Spice lovers will like this, no doubt. But as a chocolate lover I’m left wanting more. I still have a couple more of their bars in stock, so I’ll wait until I tried those before I give my final opinion.